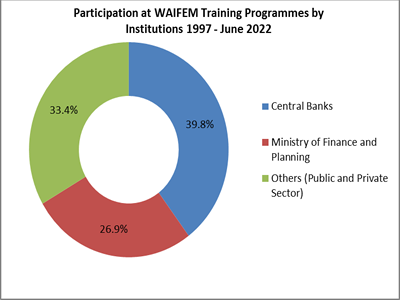 From 1997 to Feb. 2019, WAIFEM made a total of 700 capacity building interventions in pursuit of its mandate. 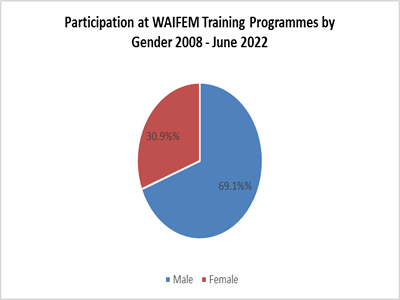 Of these events, 606 or 86.6 percent represents knowledge and skills upgrading through training courses / workshop / seminars while 94 or 13.4 percent represented missions (needs assessment and follow-up) and other capacity building-related activities, such as progress review meetings and impact assessment surveys/studies. A total of 18,722 participants benefited from the programme. 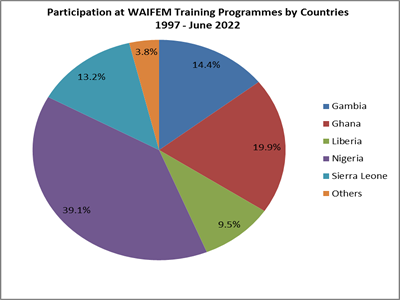 Of the total 18,722 participants that benefited from the programmes executed, Nigeria accounted for 7,325 or 39.1 percent, Ghana 3,714 or 19.8 percent, and The Gambia 2,838 or 15.2 percent. The number of participants from Sierra Leone was 2,575 or 13.7 percent of the attendees; socio-political situation in Liberia adversely influenced its low participation rate of 1,621 or 8.7 percent of the total. Non-regional participants began to take advantage of the existence of the Institute with them accounting for 649 attendees or 3.5 percent (See Graghs and Table below for additional details).